When you feel frustrated and mad, you want to storm around like a bull in a china shop and break everything. Unfortunately, in real life, you cannot really do this. Do the next best thing, and get yourself a stress bull that you can smash and bash and let out all your frustrations. He won't mind at all and nothing will get destroyed. Stress toy are great for good health, calming the mind and body and releasing pent up tension. If you are looking for a unique and different promotional item, you should consider stress toys. Your clients will keep them close at hand, in the office, at home or in the car. 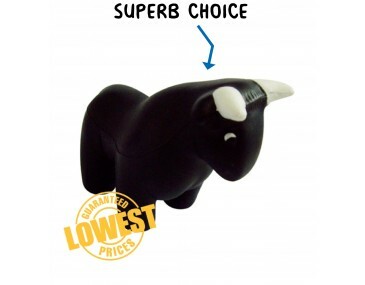 Our little bull is the ideal stress toy, he looks mean and wild and ready to bulldoze his way through anything. Made from a soft pliable material, he features a dark body in a three-dimensional shape. His horns contrast in a light colour and stick out on either side of his head. Set yourself apart from your competition when you brand these bulls with your company logo and hand them out at expos, shows, outdoor events and product launches. You will add a no-nonsense vibe to your brand. Companies in the meat industries, construction, building, or those wanting to add a manly tough feeling to their brand will find that these bulls are the ideal promotional items. Our listed price includes branding of your logo or graphic in a single colour print. We offer a product turnaround time of two weeks, but we can offer even faster turnaround times for urgent orders.